Workers’ Comp Benefits, are they Really Enough? NPR recently conducted a news investigation titled “More from Insult to Injury: America’s Vanishing Worker Protections,” and around the same time the Occupational Safety and Health Administration (OSHA) published a report “Adding Inequality to Injury: The Costs of Failing to Protect Workers on the Job.” These both got me thinking about the tightening of purse strings when it comes to injured workers collecting their benefits. Both the news investigation and the report indicate how broken our country’s workers’ compensation system truly is, and how important it is to have someone on your side to help you navigate this troubling system. The workers’ compensation system is intended to help protect employees’ rights to compensation for injuries and illnesses sustained on-the-job. Each state has its own laws when it comes to workers’ compensation benefits and the amount of compensation an injured worker will receive based on his or her injury. Almost all states require that an employer provide workers’ compensation insurance. Colorado is one of those states. Additionally, in Colorado workers’ comp benefits are the only disability insurance employers are required to offer. Because each state has its own pay scale when it comes to workers’ comp benefits, the amount received can differ state by state for basically the same injury. For an interesting read check out this NPR article. In the article, the author states that two men, who lived 75 miles apart and who both lost their left arm in a machinery accident, received very different compensations. The man from Alabama received $45,000; the man from Georgia could receive over $740,ooo during his lifetime. Alabama happens to have the nation’s lowest worker’s comp benefits for amputations according to NPR. For reference, in Colorado if a work injury results in amputation the worker is entitled to the standard workers’ compensation benefits plus additional compensation for the loss of the limb based upon statute. In their news investigation, NPR along with ProPublica looked at the “reforms” state workers’ compensation systems are going through. The investigation showed that in some places injured workers end up in poverty because of workers’ compensation cutbacks. According to NPR, the “reforms,” or changes in the system, have been “pushed by big businesses and insurance companies on the false premise that costs are out of control.” In turn, insurance companies in 2013 had their most profitable year in over a decade, and brought in an 18% return! Since 2003, legislators in 33 states have passed workers’ comp laws that reduce benefits or make it more difficult for those with certain injuries and diseases to qualify for them. Where a worker gets hurt matters. Because each state has developed its own system, an amputated arm can literally be worth two or three times as much on one side of a state line as on the other. Many states have not only shrunk the payments to injured workers; they’ve also cut them off after an arbitrary time limit — even if workers haven’t recovered. Judges even seem to think current workers’ comp benefits are not adequate. One Florida judge in August of 2014 ruled that the Florida Workers’ Compensation Act was unconstitutional and that law the “fails miserably” when it comes to workers’ safety, health, welfare, and Morals. Florida Workers’ Advocates v. State of Florida, Case No. 11-13661 CA 25 (Aug. 13, 2014) (also known as Padgett v. State of Florida). The case specifically looked at the Act’s exclusive remedy provision, which provides that workers’ compensation benefits are the only remedy when hurt on the job. Florida has eliminated, as of 2003 amendments, all compensation for permanent partial disability, which means your impairment has to permanently and totally disable you. The OSHA report released in March of 2015 provides a solution to the workers’ compensation system. Simply put: to make greater efforts to prevent workplace injuries and illnesses, which of course the law requires. Additionally, it would spare workers and their families from “needless hardship and suffering” due to the injury. Work injuries don’t just physically hurt you; they also hurt your financial stability. OHSA realizes that workplace injuries and illnesses create income inequality because they end up forcing working middle class families into poverty, and keeping lower-wage workers and their families from entering the middle class. Furthermore, according to OSHA’s report, employers only provide about 20% of the overall cost of workplace injuries and illnesses through workers’ compensation. So, who is responsible for the other 80% of costs associated with the injury or illness? It appears to be the injured workers, their families, and taxpayers who are subsidizing the vast majority of the costs of these injuries according to OSHA. 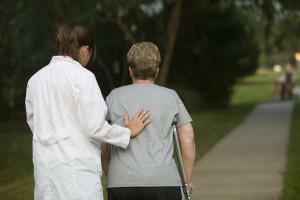 Taxpayers, through Medicare and Medicaid alone, end up paying almost 19 percent of the medical costs of these injuries. See Journal of Occupational and Environmental Medicine, 54:445-450 (2012). The OSHA report also states that the costs associated with these injuries that workers’ compensation does not cover or which “the social safety net” does not cover, increases financial burden on injured low-wage earners and their families, and thus, places extreme financial constraints on those families. Therefore, these constraints create a huge social problem—income inequality. Additionally, according to the report, less than 40% of eligible workers apply for workers’ compensation benefits. And those with work illnesses are even less likely. One study estimated that up to 97% of workers with an on-the-job related illness are uncompensated. See JP Leigh and JA Robbins, Occupational disease and workers’ compensation: coverage, costs, and consequences, Milbank Quarterly, 2:689-721 (2004). The widespread use of temporary employees provided by labor staffing agencies. Workers’ compensation cases are already complicated, and the ever changing adverse views on these benefits often require an experienced lawyer on your side. Whether you need help filling out paperwork to report your work injury or illness, or you’ve just been denied benefits and need to appeal your claim, McDivitt Law Firm is ready to help you. Click here for a free initial consultation form.